The city of Valencia had two reasons to celebrate on the football front as Levante UD have secured their La Liga status for another campaign and Valencia CF have confirmed their Champions league spot for next season. With a comfortable points cushion for that coveted fourth place it was always going to be difficult for the fifth placed side Real Betis to overhaul Valencia. The Andalusian club’s loss at Athletic Bilbao in early May ensured that manager Marcelino and his Valencia team completed a massive turnaround from last year’s disappointing twelfth place. It was a huge relief to many of the Valencia fans as the club’s recent form has been patchy to say the least. The wins over CD Leganés and Espanyol were tense affairs that the team just edged. A good performance at the Camp Nou, against the champions FC Barcelona, saw Valencia unlucky to lose 2-1. Since then the club have been winless in four games. 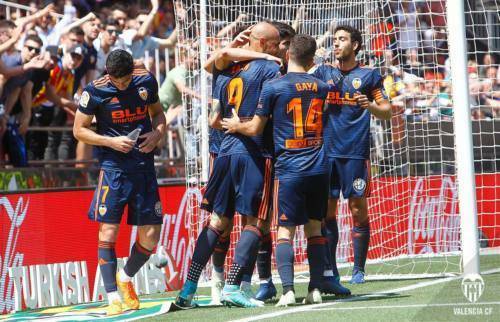 The biggest shock came with the home defeat against a resilient Getafe side. 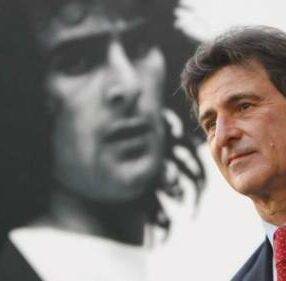 The teams had fought a bruising affair in the Coliseum Alfonso Pérez earlier in the season and there was no reason to expect that the team from the outskirts of Madrid would not try to make the contest a physical battle once again. True to form, it was a niggly contest with Getafe’s pantomime villain Damien doing his best with his fellow defenders to ruin any fluid football Valencia tried to play, by fair means or foul. The seven bookings the visitors accrued throughout the game counted for little, and in Loic Rémy they had a striker in clinical form. Subsequently, the former QPR, Newcastle and Chelsea star punished two lapses in concentration in the Valencia defence to put Getafe two up. A strike twenty minutes from time from Rodrigo reduced the deficit. However, by that time Getafe’s mindset had been strengthened by some weak refereeing decisions and they stayed resolute and aggressive until the final whistle to stroll off the field at the end of the game with all three points. A trip to Galicia and Celta Vigo followed. The first half had very little incident in either penalty area but the second half came alive on the hour mark when former Vigo favourite Santi Mina finished in fine style with a lethal shot across the keeper that nestled into the corner of the net. Valencia’s lead lasted all of four minutes before Maxi Gomez levelled with a strong header from a free kick that wrong-footed Neto and crept over the line, despite the best efforts of the Brazilian keeper. Both teams had a couple of chances each to win the match but the game ended in stalemate… and a valuable point was added to Valencia’s tally. The club’s penultimate home match was against La Liga’s smallest club Eibar. The Basque side’s story on how they were promoted to the top flight of Spanish football a few years ago only to be denied a place in it initially on financial grounds is well documented. Then, a shrewd pre-season share scheme called ‘Defiende al Eibar’ (Defend Eibar) was then put in place and thousands of football fans worldwide bought shares in the club for a minimum of 50 Euros each. 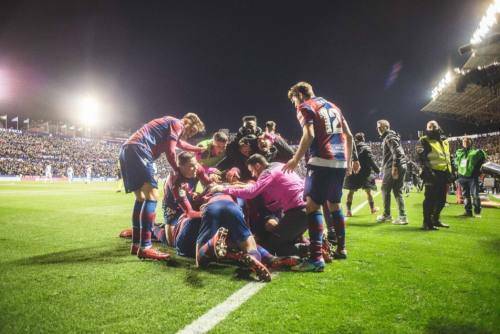 The Eibar coffers were swelled by several millions and as a result the Spanish Football Federation relinquished and allowed them to take their rightful place in La Liga. Known as ‘Los Armeros’ (The Gunsmiths) due to the arms factories in and around the town of under 30,000 habitants they are the “second team” in Spain of many football fans because of their romantic underdog status. Fielding former Valencia players Yoel and Fabian Orellana in their team, Los Armeros built a fortress of their own in front of their goal that Valencia did not have the firepower to break down. For only the second time this season, the club were involved in a goalless draw in the league. However, it did mean another point for Los Che. Consequently, just another solitary point would claim Champions League football for Valencia, even if Real Betis did win their remaining three games. As it happened, Betis played their game in Bilbao a few hours earlier than Valencia in Villarreal and lost 2-0 to the home side. Former Valencia favourite Aduriz added to Muniain’s first goal in stoppage time to secure victory for the Basque side and put the Valencia fans in celebratory mood as they headed for the East Coast local derby in El Madrigal or Estadio de la Cerámica as it is now officially known. Marcelino was given a warm welcome by the home fans on his first return to the club he had taken to the Europa League semi-final in 2015-16. Valencia could now play with a freedom knowing that a Champions League place was secured whilst Villarreal needed a victory to virtually assure Europa League football returned once again to their patch next season. The urgency initially laid more with the hosts and as the game went on Villarreal looked the more likely winners. So it proved, as Mario Gasper scored a late winner for the ‘Yellow Submarine’. 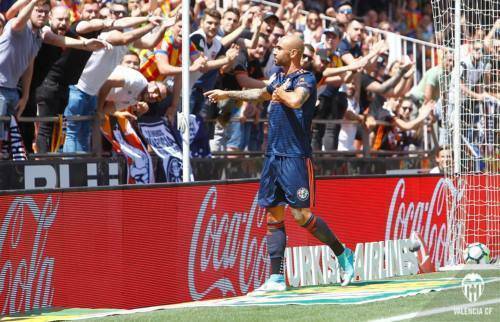 However, it did not dampen the spirits of the large Valencia contingent in the stands and both players and fans celebrated their confirmed fourth place in unison in the stadium well after the game finished. The two games left, away game at Girona and at home to Deportivo La Coruña will be relaxed affairs now the job is done and this week the club fly out to play in Saudi Arabia for a money spinning friendly against the local side Al-Nassr FC. This is the third time the teams have played each other in recent years and the Brazilian legend Ronaldinho will be making a guest appearance for the Riyadh based club. Meanwhile, Levante UD have found a new lease of life under the new interim manager Paco López. Three consecutive wins against Malaga and Sevilla at home and away to Bilbao have ensured the club remain in the top flight and that Deportivo La Coruña, Malaga and Las Palmas will be the relegated clubs this season. This is especially pleasing for the Levante season ticket holders who have attended every league game as they will receive a free season ticket next year as part of a deal that the club struck with fans before their first home game last year against Villarreal. Granotas fans really enjoyed an epic match recently, with Levante UD beating La Liga champions FC Barcelona 5-4! Anyone wishing to get tickets for the Valencia or Levante games can do so by visiting the ticket offices at the stadiums or through the respective websites.